Arianespace has announced OneWeb, the broadband Internet provider seeking to deploy more than 600 satellites into low Earth orbit, as the launch customer for the inaugural flight of the new Ariane 6 rocket in 2020. Officials announced the agreement hours after the successful deployment of OneWeb’s first six broadband satellites Feb. 27 aboard a Soyuz rocket launched from French Guiana, a mission managed by Arianespace, the French launch services provider. “This agreement consists of OneWeb’s use of the inaugural Ariane 6 flight,” said Stephane Israel, CEO of Arianespace. The first Ariane 6 launch will fly in the Ariane 62 configuration, with two solid rocket boosters augmenting thrust from the rocket’s core stage Vulcain 2.1 main engine. OneWeb secured options for three Ariane 6 missions when it signed the original Soyuz launch contract with Arianespace in 2015, a deal which officials said then was the most lucrative commercial launch contract in history. OneWeb has booked 21 Soyuz missions, including the launch Feb. 27. The following 20 Soyuz flights are expected to loft up to 36 satellites at a time from launch pads in at the Baikonur Cosmodrome in Kazakhstan, the Vostochny Cosmodrome in Russia, and the Guiana Space Center in South America. OneWeb’s satellites are in polar orbit around 745 miles (1,200 kilometers) above Earth, but the Soyuz launchers release the spacecraft — each about the size of a mini-fridge — at a lower altitude. The satellites use plasma thrusters to maneuver into the OneWeb constellation. With OneWeb’s agreement to launch its satellites on the first Ariane 6 flight, the company has two more options for future Ariane 6 missions, Israel said. Terms of the new agreement between OneWeb and Arianespace were expected to be formalized in March, Israel said in his remarks after the Feb. 27 launch. OneWeb and Arianespace have not said how many satellites will launch aboard the first Ariane 6 mission. The Ariane 62 variant can deliver more than 30 percent more mass than the Soyuz to the type of orbit used by OneWeb’s satellites. ArianeGroup, the leading shareholder in Arianespace and builder of the Ariane rocket family, aims to have the Ariane 6 rocket ready for its first launch at the Guiana Space Center in July 2020. The Ariane 6 will come in two configurations — an Ariane 62 with two boosters and a heavier Ariane 64 with four solid-fueled motors — to replace the Ariane 5 rocket, which has accomplished more than 100 flights since debuting in 1996. ArianeGroup says the Ariane 6 will be less expensive than the Ariane 5, and will offer expanded capabilities, such as a heavier lift capacity and an upper stage engine designed for multiple ignitions, allowing the new rocket to place satellites into different orbits on a single flight. Developed in a cost-sharing arrangement between European Space Agency member states and ArianeGroup, the Ariane 6 will use an upgraded hydrogen-fueled Vulcain 2.1 engine similar to the powerplant on the Ariane 5’s first stage. 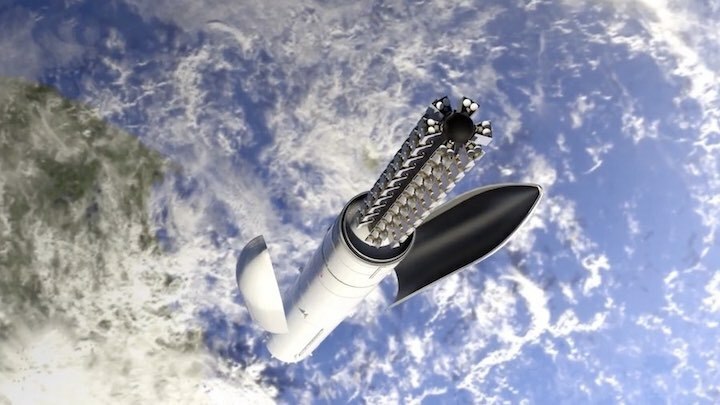 A new Vinci engine will replace the HM7B upper stage engine on the Ariane 5, and the Ariane 64 version will deliver up to 11.5 metric tons — more than 25,300 pounds — to geostationary transfer orbit. 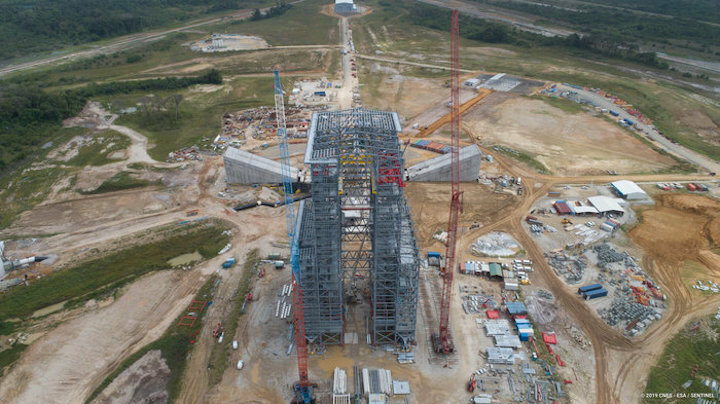 Construction crews in French Guiana are building a new launch pad for the Ariane 6, which will be assembled in a horizontal hangar, then rolled out to the pad a few days before liftoff and erected vertical inside a mobile service tower, where satellites will be mated to the launcher. OneWeb plans to deploy 648 satellites over the next two years to begin initial global broadband services, beaming high-speed Internet signals to far-flung locales, rural users, ships, airplanes and others outside the reach of terrestrial broadband coverage. OneWeb’s first 10 satellites were built at a spacecraft manufacturing plant in Toulouse, France, and production will soon move to a new factory operated by OneWeb Satellites — a joint venture between OneWeb and Airbus Defense and Space — at Exploration Park in Florida. The new factory will churn out up to 15 satellites per week for less than $1 million per spacecraft, according to OneWeb.